One of the reasons I haven’t kept up with blogging is because I always want to wait until I have the final, perfect draft before I post to my blog. But the thing is, I never have final perfect drafts of anything. So I have to get over that. What I do have is a lot of decent ideas and thoughts in the Notes App in my iPhone. Yesterday, as I pushed my five-month-old around the neighborhood, I wrote out 4 goals for this school year in my Note as she slept. Now mind you, this is a draft. But the beauty of sharing it before it’s finalized is that I can get feedback from all the (zero) folks reading my blog. So what I have here are my goals and shorter “titles” for the goals. Neither is an expanded version of the goal, but if I wait until I write the expanded versions this post will never get published. So there may be a later blog where I expand on the goals and there may not. I guess it depends on whether I get any feedback and/or how long my daughter naps this afternoon. 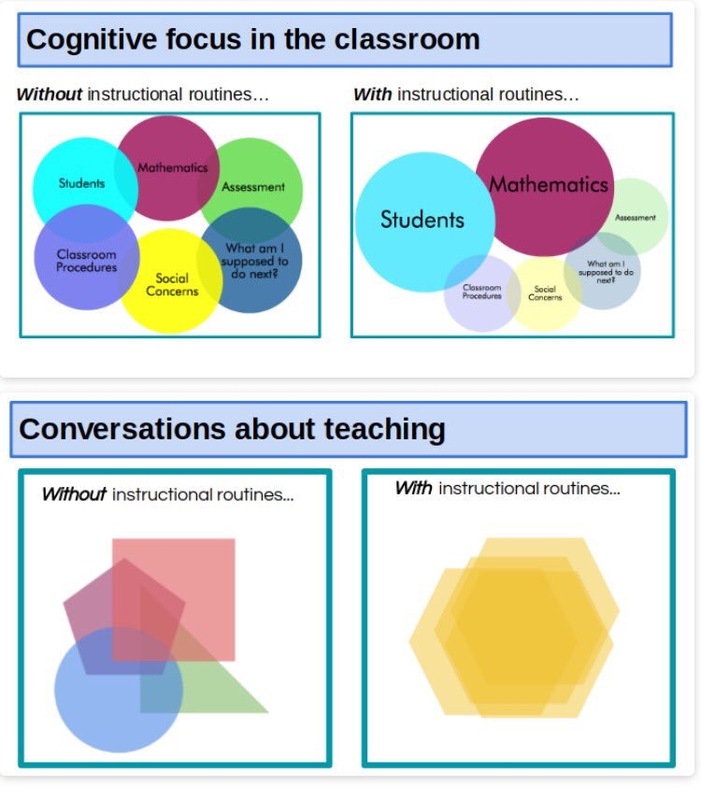 Create a culture that encourages positive and meaningful relationships between all members of the classroom community and helps everyone achieve success based on their own ideas/measures of what success looks like in a high school math class. Increase students’ abilities to think, learn, reason, sense-make, and develop logically sound conclusions both independently and collaboratively. Expose students to my vision of mathematics: Math is not about problems and answer getting but rather about questioning, exploring, discovering and adventuring. Prepare students for future endeavors in mathematics, and education in general, most importantly the ones they will experience in the next 1-3 years of high school. (Most notably PreCalc and Calculus and/or Statistics). I think those are some pretty solid goals. I’m not sure if they are well organized. I don’t want ten goals. I also don’t want one. I want my students to know this class is as much about them as it is about Mathematics. Any feedback would be awesome. I will have a set of 10 folders for each class numbered 1 – 10 to match each group number. Every class will have a different color so they don’t get mixed up. At the beginning of class there will be one folder at the corresponding group of desks. The first HW of each Cycle is due on on Day 2 (there wont be HW on the day between Cycles as we transition to new groups). HW will be graded and returned to the folders which are returned to group tables before the next class. When students come to class the next day they take out returned and checked HW, then put their new HW in the folder. They look over their returned assignments for lingering questions. I will take questions after opening activity (in front of the whole class) or whenever students want (on the side). If there are problems that most of the class had trouble with I will address those as well. As mentioned earlier there will be no HW assigned on the last day of a Cycle. On that day students have taken a summative group assessment. I don’t have a problem giving them the night off after that, and it avoids me the problem of having group folders with student work that won’t match up with the groups of students the next time we meet. Takes no class time. Except for questions after papers are returned. In the past I have tried circulating and checking HW at the beginning of class. This would take time and wouldn’t allow me to be present in helping get the class started off right. With this plan all I have to do is grab the HW box after 2 minutes and address groups or individuals who didn’t get the work in on time. Once they see I’m serious I don’t think this will be an issue either. Makes it super easy to collect and return work as papers never leave the folders. I won’t have to pass out any individual papers. Allows me more time to closely examine homework and give feedback. Occasionally I would do that last year and I liked it. It was a very low stakes way to assess and provide commentary and help. I could give a kid a 5/5 and still point out mistakes and give appropriate hints or help so they could fix them. Obviously this can’t be done if your checking HW during class time. Encourages students to get to class on time and get their stuff out quickly which helps get them focused and ready right away. Adds another element of structure and routine to the class. Students know what they are supposed to do first and from there they can transition to what’s next. Doesn’t give students time to copy HW at the beginning of class. In the past if I circulated and checked HW during class students who saw I wasn’t coming to them right away would try to pull this off. What a terrible way for their valuable class time to start! Holds me accountable for grading the HW in a timely manner. Those papers are not leaving the folders and the folders aren’t leaving my classroom. If I don’t get around to grading them the folders will still go back on the desks and everyone in the class gets a 5/5. Obviously I don’t want to give undeserved credit so I’ll be motivated to stay on top of it, but it safeguards me from ever having stacks of ungraded and unorganized HW. This happened two years ago when I tried having every student, regardless of class, turn their homework in outside my door before school started at 8:00. That works for one of my colleagues but it didn’t work for me. There isn’t a hard and fast rule against asking questions on the most current HW. Students who have a pressing question will be encouraged to write it down or take a picture before class and ask it anyway. A lot of folks love lagging homework. I agree that it’s a cool idea, but it doesn’t work particularly well with my style of curriculum/instruction. Passing back and going over the HW a day behind does add a bit of the lagging element. There’s a good chance that some of the questions that might have been asked about the HW will be addressed in the lesson in between. (In fact, the way our curriculum is set up I assume that will often be the case.) When students get HW back the next day it’s likely that they can self assess and self correct. So yeah, lagging HW review. I like it! The other negative that comes to mind is the fact that I won’t be giving HW every other Monday, basically just to make my life easier. This doesn’t bother me one bit. Also, I have Quizzes to grade that day/night. Who knows, maybe I’ll do no HW every Monday! That’s it. That’s the plan. I’d love to hear feedback especially if you can think of more positives or more negatives for my list. First off, it’s important that I share my school’s bell schedule so this all makes sense. We are blocked. Monday we meet every class for 1 hour. The rest of the week we alternate periods 1, 3, 5 and 2, 4, 6 and classes last 2 hours each. So on a given week I see Period 4, for example, 1 hour on Monday, and 2 hours on Tuesday and Thursday. This year I’m planning on a “2 Week Cycle” for my groups. This means groups will change every two weeks. I have tables of 4, but I plan to make groups of 3 students. The other table will be used for HW folders (see my upcoming HW post), materials, etc. I’m crossing my fingers and hoping for enough desks and < 30 students per class to make this work. I have 9 (hope to make it 10) Vertical Non-Permanent Surfaces (VNPSs) in my room so I will have 9-10 groups (depending on how many students I have). I use a deck of UNO cards to create Visibly Random Groups by handing out the cards at the door at the beginning of each cycle. Cycles will start on the first 2 hour day of the week (Tuesday or Wednesday depending on the Period) and then follow a fairly specific routine. from David Wees at #TMC16 and it made a lot of sense to me. I realize that my class needs more structure this year. The two week cycle is in part a result of this need. I also want to note that last year we did one week cycles with some of the same structures in place so this is not a 100% change for me but closer to the 10% that Dylan Kane and others have talked about. New Groups. We will start with something to help students introduce themselves. Most likely this will come in the form of a Notice & Wonder, WOBD, or some sort of short enjoyable problem related to the current topic. Then we will continue with the general curriculum program. I will make sure that there is some element that requires the students to get up and work on their VNPSs with their new group mates on Day 1. This should help them get to know each other and start working together. I will pass back the Group Quizzes (from Monday) with scores but usually without comments. Now that groups have been switched I will ask students to compare answers within their new group and work together to complete “Corrections” for Group Quiz. I haven’t decided exactly how I want the corrections to be done but I’ll get there. The rest of the class period will be used to continue with the curriculum. Students will break apart their groups for an Individual Assessment. This will be short and summative. Students will get back their Individual Quizzes and do corrections with their group mates. Lingering questions can obviously be addressed with me. The groups will do a Presentation. In my class “Presentation” has a broad definition but basically it’s an answer to a prompt that requires a lot of explanation and students have to present their explanation in some organized format (usually on their VNPSs). As mentioned before students will complete a Group Quiz and bid their group mates farewell. So ends the Cycle. There will be some nuances and exceptions. Now and then I like to let students choose their own groups for specific tasks, and I will probably continue to do that. Holidays will throw the cycles off at times and we might skip a Quiz as a result, but in general I think this should last throughout the year. I’m determined to stick to it and see how it goes at least through the first semester. Please, please, please give me feedback or suggestions now if you have any. I’m putting this in place in 2 weeks and after that there’s no turning back! My students like easy work. This is somewhat bothersome. I don’t blame them for liking what they are already able to do, but I would like to think they they would prefer a challenge, something that would lead to real thinking, new understanding and growth. I often get the feeling that they would rather just practice math that they already know. Like they just want to stay inside their comfort zone, all the way in the middle of their own personal ZPD. Today’s class was engaging, not because it was a great mathematical exploration but because it was review. This is frustrating for me. Opportunities to build confidence are important. This is a counter to my last point. I think it’s important to embed math that my students are already good at into my lessons. For one, it’s always good to review. Secondly, it gives students opportunities to share things they know with new people. Third, and most importantly, it helps them remind themselves that there is some math they are good at. As my students worked through the problem set, I heard them saying things like, “I feel smart!” and “I get this!” That’s got to be worth something. And I think it turned their brains on for the rest of the class period. Like they got a little confidence/adrenaline boost from completing the problems. It also gave the students who typically struggle an opportunity to be on level footing with the ones who typically thrive. Definitely worthwhile. My students have learned to work well together. This is huge. As the students worked through the problems I saw groups of students sharing answers, freshmen helping seniors, and pairs arguing about solutions and debating pathways. I see the collective effort of my class in a way that I haven’t seen in previous years. I feel great about this. It can’t be understated. It got me back to this blog! Cancelling out is a thing for my students. Ugh. Everyone solves by cancelling out. 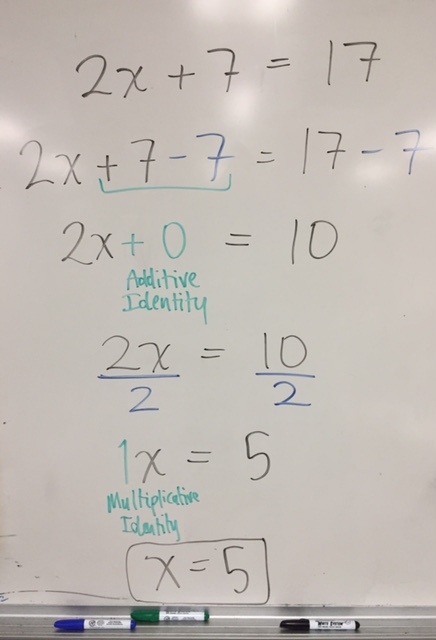 I asked students to share how they answered the first problem: 2x + 7 = 17. Almost everyone shared that they had subtracted 7 from both sides. Okay, good. (I refrained from asking why both sides. We’ve been over this many times.) Then cancelled the 7. How did you “cancel” the 7? Huh? That’s just what you do. But why does it cancel? I think they know that 7 – 7 = 0, but I don’t think that’s part of the solving process for them. I talked about additive and multiplicative identities for a bit. I made a fuss. We moved on. Solving without crossing anything out. My students use procedures before thinking. After students shared the “cancelling method” I asked if anyone had done it another way. Everyone was quiet for a while so I asked Ruben. I knew he had a different method. “I just looked at it, and I knew it had to be 5,” he said. I looked at the rest of the class. “Yes?” Many of them smiled. “Well yes,” their eyes told me, “but that’s not how you do it!” I disagree. That’s how I do it! 2x + 7 = 17 ? Two times what is 10? 5. Done. They must have been taught that they shouldn’t do the problem that way. It was as if they knew they weren’t allowed. But why not!? I’m a fan of doing easy mathematics the easiest way possible. It’s efficient. If a problem doesn’t require an elaborate strategy then you should only use one if you like that sort of thing, not because you’re a robot who recognizes problem types and executes procedures. Eventually problems will get more messy and students may need a more sophisticated strategy, but until then they shouldn’t be deprived of an approach that results in the correct answer. My students want to know why. Another huge win this year. They expect this from me. They know that I am going to talk about the whys. They knew there would be more explanation for 2x + 7 = 17, even when they already knew how to do the problem. I hope they take this with them to their next math class. I hope they demand this from themselves and their teachers. Math is not the same without the whys. Random grouping matters. This will be another blog post. I used UNO cards this year. New seats every week. My Algebra 2 classes have students from every grade: advanced freshmen, seniors who haven’t been mathematically inclined, and everything in between. I mentioned earlier that freshmen were helping seniors. In previous years, I’d keep them separate for fear they’d make each other uncomfortable. But random grouping didn’t allow for that. The result is a classroom where more groups and pairs of students are comfortable working together. As the year has gone on I’ve become more lenient about students leaving their seat or even group to seek help and the results have been great. Again, I will post about this later. Thanks to Alex Overwijk and others at TMC15 for convincing me to do this. I’d like to share what I did next, but that is for another post. Now, like my students, I need to stay motivated! Okay so Igniting is a doozy. Seriously. I was sitting at a table with my fellow Igniters, in the front of that huge room buzzing with math educators from across the country, and we were all nervous. Robert Kaplinski and Laila Nur had done this before – didn’t matter – nervous. Blue Taylor had flown across the country to be here, done two talks earlier in the day and was completely fried – still nervous. Even NCTM President-Elect Matt Larson (who was about to completely crush his talk) was nervous. We all talked about what a challenge preparing an Ignite had been and how many hours we had put in trying to get it right. And then we were off. And I gotta say – We rocked it. Everyone was awesome. It was fun, it was funny, it was informative, and it was inspiring. I’m so proud to have been a part of it. Kudos to everyone and thanks to the Suzanne, Annie and Math Forum for making this happen! You can catch all the Ignite Talks from CMC-South here. Watch them all! As for myself I felt surprisingly fired up when I stepped on stage. It was cool to have Brian Shay up there to roast me a little to calm the nerves (I knew he would) . Once I got rolling, despite the fact that I was about 60% blacked-out, I felt like I was going to get through it, like it was going to work out. And then the dry-mouth set in. I saw it coming actually. I kept looking at my empty water bottle as the people ahead of me were speaking, wishing it would magically fill up on its own. I even went to try to get some water in the back. But there were hundreds of folks in the room and one little jug so that didn’t work out for me. I wished I had followed Robert’s lead and brought a Heineken up there with me. Anything would have helped. As soon as I started talking my mouth started significantly drying up. About halfway through I realized I had to say something before it was too late, before I just stopped talking altogether and no one could figure out why. So I did. And thank goodness for Suzanne. She had a cup with some ice in it. Which was funny, because my initial reaction was, “This is ice.” I said it right into the mic. I think it was hard to process anything besides what I was supposed to be saying in talk. Like, “Hey, there wasn’t any ice in my slides. What am I supposed to do with this?” And I remember thinking, “Should I take a whole piece? Won’t that make it hard to talk?” But the thing about ice is – it melts. So there was a little bit of water at the bottom. Like the tiniest amount. It was all I needed. Problem solved. So I got right back to it and only missed about a half a slide worth of words. I didn’t get to show Christopher Danielson as much love as I had planned. I mean “Find what you love about the Mathematics you teach. Do more of that with your students.” was pretty much my whole message and I pretty much got it from him. So yeah. I was going to tell everyone to look up his keynote from TMC. It was awesome. Go look now. Igniting was a lot of work, but it was crazy awesome. I’d do it again. Maybe someday I’ll get that chance. Until then I look forward to seeing what other Igniters come up with. My words of advice – Have fun and bring a drink! * In a couple days I’ll post my script and my slides if anyone’s interested. I’ll try to remember that #nobodycares.